Tonight's meal was entirely centered around using the tat soi - what I read about it implied that it didn't last long, so I should use it first. I decided to cook it with the pattipan squashes. First I cut up the garlic scapes and fried them in olive oil for about a minute and then added the cut up squash. This was sprinkled with a lot of maple pepper, my favorite seasoning for squash. At the last minute I added the tat soi and stirred it until it was soft and wilted. This was served with lamb, garnished with the pineapple mint jam, and grilled pineapple. It all was delicious! Followed by the salad course: red leaf lettuce, salad greens, goat cheese, mulberries, more garlic scapes (raw this time), and radish, with a maple balsamic vinaigrette dressing. I don't think I've eaten this much salad since I moved out of my parents' house. But I've been enjoying playing around with the different greens, adding a variety of fruits and cheese in almost every one. (Mango, cilantro, and goat cheese make a great combo, by the way.) Just one month of this farm share has really expanded our menu - and we've been known to eat almost anything. Another week, another farm share. More new things for us to try! This week the haul was even bigger; here's our half: 2 pattipan squashes, 1 head of lettuce, 1 large bowl of mixed greens (mustard, spinach, arugula, and mizuna), 5 scallions, 2 large radishes and a small hakurei turnip, 10 baby carrots, 5 garlic scapes, 1 joy choi, 1 bok choi, and 2 tat sois, 1 pint strawberries and 1 cup of snow peas. Wow. And it's just going to be more and more each week! Add to that the mulberries picked from the tree around the corner (at least 1 pint! what a tree!) and we have the makings for some great salads, stir fries, and snacks. Tonight it's a salad, and I have to run to the store to get some goat cheese and some hamburgers. Look at all this wonderful stuff (and this is only a little bit of it all)! I have worked 36.5 hours in the last 3 days, including the overnight last night, and it was rather stressful. By the time I got home I was too stressed to sleep. It's also POURING outside. But, the mulberry tree is almost at its peak, so I put on my not-really-waterproof-anymore raincoat and headed out to the tree. With a lot of patience, a lot of strange looks from drivers going by, and not minding the rain, I ended up with almost a full quart of mulberries! We've never gotten that many at once before! "Why do you always can the fruit and not let us have any?" "Well, there are plenty more berries on the tree that have yet to get ripe - we can go back." Today I a lso tried something new. 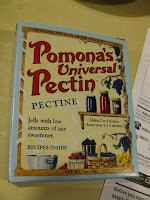 I had picked up a box of this pectin at Whole Foods a few months ago, but wasn't sure about using it. 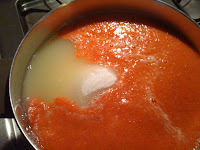 It requires making a calcium solution and adding it to the fruit which then activates the pectin. Because it's titratable, it's perfect for times when you don't have enough fruit for a full batch. 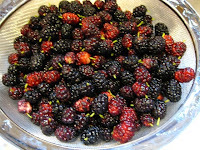 In this case I had 2 cups of crushed mulberries, to which I added 2 T. of lime juice, 1 tsp. of the calcium mixture, 1 cup of sugar and 1 tsp. of the pectin. Worked out great, and I ended up with 1 half-pint jar and 1 12-oz jar of jam. After processing for 10 minutes and hearing them "pop!" I went and took a nap, finally. I'd always assumed that beet greens were there so you could get the beet out of the ground. I never thought you could actually eat them. Hmmm. Tonight for dinner we had the beet greens. I found this simple recipe and got started. But what to do with the little tiny beets that came with the greens? I trimmed them, put them in boiling water for a few minutes, and fried them with the greens. The greens were sweeter than a lot of the other greens we've tried in the past. I might even seek these out in the store (or, at least, not throw them into the compost heap when I'm pickling beets this summer)! 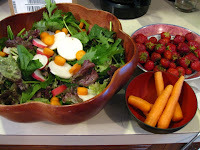 We also ate the salad greens with the snap peas, turnips, radishes, some mulberries we picked from the tree around the corner, carrots, cukes, and goat cheese. Kids were not so interested but the grown ups had 2 helpings each. When we woke up this morning, it was pouring. Drat! This was the day I'd planned to go strawberry picking and get some stuff put up. Well, fortunately, the rain mostly stopped and I decided to go anyway. It was a great thing - there was no one there (for a while, I was the only person in the field) and the strawberries were plentiful. I filled an entire flat in less than 45 minutes and in only half of one row. I didn't even need to wear the rain pants and hat! As I mentioned in a previous post, I needed to make a double batch of strawberry jam and some strawberry lemonade concentrate. Unfortunately, my canner didn't hold enough jars for me to make a double batch in one fell swoop, so I had to make 2 single batches. Fortunately, jam goes quick: wash, crush, measure, boil, add pectin, put in the jars. Each batch made 4.5 pints so I have LOTS of jam this time. But it was really pretty when I added the lemon juice - it formed a yin-yang of pink and yellow that disappeared before I could get my camera going. Ah, yes, the camera. I'm using my iPhone because for some reason, our little Elph is having lens issues. I think someone may have dropped it one too many times? 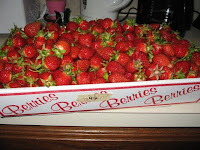 Regardless, I'm exhausted, and I still have a lot of strawberries to go. Imagine how it was last year when I had 2 flats full! This week the farm share consisted of lettuce, spinach, bok choi, scallions, radishes, snow peas, strawberries, and some Hakurei turnips which are edible raw. Mmm. 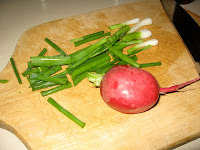 I went up to my roof deck and harvested a few radishes of my own (red and white), some more spinach, and a few of my shelling peas (well, all that were ready) and made a salad with the shelled peas, lettuce, a little spinach, radishes and one of the turnips. I fried the spinach with a little garlic in olive oil. 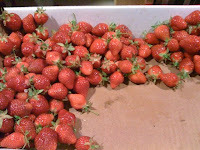 The strawberries were devoured for dessert. 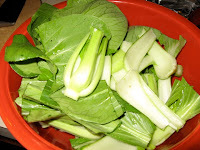 Tomorrow night I'll make a stir fry with the bok choi, scallions and snow peas. We are liking this farm share thing! While this entry is not about canning, it IS about cooking, and anticipation of canning! As I mentioned in my previous post, my sister-in-law and I are splitting a farm share. This our first year and we didn't really know what to expect. Yesterday we met at the farm and picked up our first share: 1 head of lettuce (which she kept), 9 bunches of bok choi, a bunch of HUGE radishes and a bunch of scallions (all of which we split). Since it wasn't really enough to preserve in any way, but it was enough to make a very fresh dinner, I set to work finding a recipe or something. I pulled Everything You Want to Know About Chinese Cooking off the shelf. I have had this book since college, but it's so labor intensive I haven't made anything since the Velvet Chicken attempt (VERY yummy, took ALL day - really). Thumbing through it I found a recipe for braised oysters with scallions and ginger. I decided I could add the bok choi to this and come up with a single dish. It was a little labor intensive but not nearly as bad as the 4-6 hour prep time recipes! And, even better, it cooked up in about 5 minutes. All the bok choi and scallions used up in one meal (I ate the radishes as I'm the only one in the house who likes them) and no leftovers! 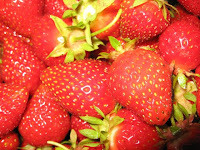 Jams: Strawberry Jalapeno (2), Strawberry Lavender (2), Wild Blueberry (5), Golden Plum (4), Red Plum (3), Peach (5), Peach Jalapeno (3), Cranberry Habanero (4), Raspberry (4), Rhubarb Pineapple (2), Apple Pie in a Jar (2), Carrot Cake (2), Fig (3), Quince (with Vanilla beans (3), crystallized ginger (2), cardamom pods (3), and cinnamon sticks (1) in the jars), Peach Marmalade (1), Strawberry Rhubarb (5), Sangria (1), Pineapple Mint (4), Meyer Lemon Marmalade (4), Blackberry (5). Jellies: Concord Grape (4), Muscat Grape (7), Spiced Plum (3), Mint (from my garden) (6), Zesty Watermelon (2), Vanilla Pear (4). Preserves and Compotes: Black Forest Macaroon (2), Pear Almond Compote (3). Fruit in syrup: Peaches (1), Mulberries (1), Blueberries (2), Strawberries (4), Raspberries (2). Salsa (tomatoes, cukes, and peppers from last year's garden) (3). Sauces: Cranberry (2), Applesauce (3). 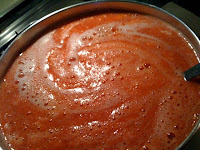 Tomato Sauces: with Italian Spices (1). Pickles: Fiddleheads (4), Dill (4), Bread and Butter (3), Eggplant (1), Watermelon Rind (1), Three Bean Salad (1), Toorshi (1). Meat Stock: Beef (6), Turkey (2), Chicken (2). Soups: Turkey Vegetable (1), Split Pea with Ham (1), Kale and Chourico (4). This also helps me plan for the summer - I need to make at least 2 batches of strawberry jam and more of the strawberry lemonade concentrate (that was a favorite). More tomato sauce, but with just persian spices this time. Those got used up pretty quickly. Spicier salsa. Definitely more peaches - they keep really well. No plums in syrup - they disintegrate. I need to send the kids out for mulberries again or see if my neighbor will give me some from her trees. Applesauce always goes fast, will have to go apple picking in the fall again. I also am splitting a farm share with my sister-in-law and hopefully will get lots of beets, cukes, and other things I can pickle. The dills are popular. 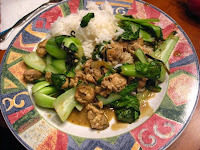 The B&B recipe I used last year, with rice vinegar, tasted good but the cukes were too thick. I need to cut them thinner. Everyone liked the beets in the 3 bean salad so I think I'll try that again. 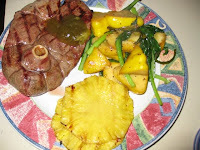 Another thing - the pineapple mint jam is AWESOME on lamb chops. And baked potatoes. Thanks to Mom for that suggestion!